I came across this blog post yesterday and it totally hit home for me. IT’S OKAY TO USE THE SAME CHRISTMAS DECOR EVERY YEAR. Sure, it might be a little fun to change things up and go with different themes and colors and whatever, but aren’t the holidays more about traditions and family and memories? 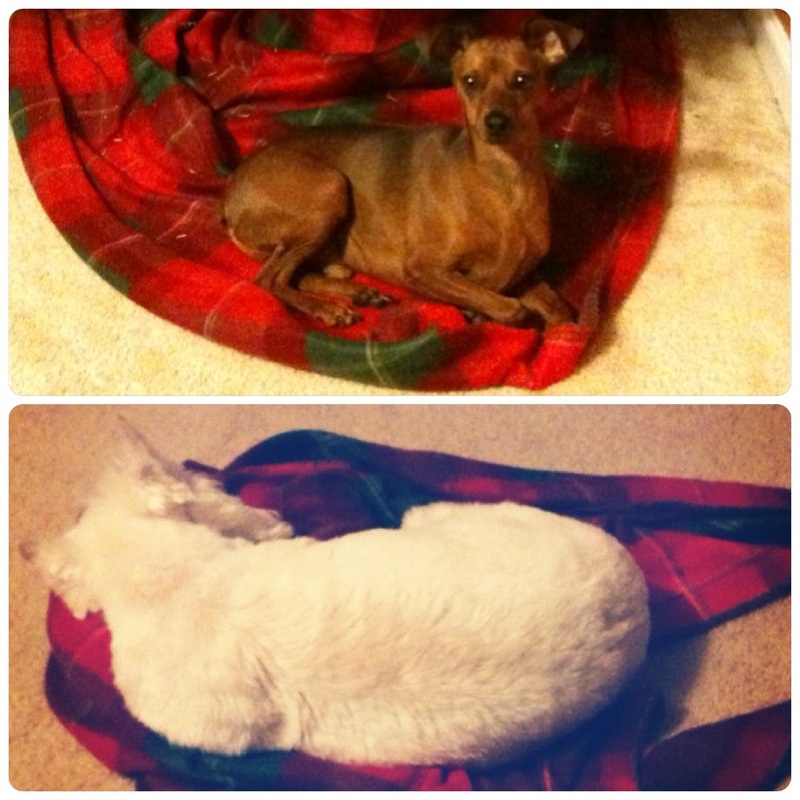 They are to me. To me, the best decorations are the ones you bring out every year and they remind you of something. They bring back a memory that makes you reminisce. Sure, add to your decor little by little every year – add a new memory, add a handmade ornament, add something you found that you loved and couldn’t pass up, add other decoration items you’ve handmade and/or up-cycle something you already have. There are so many blogs out there that showcase a new theme of their Christmas decor and yes, that could be fun, I admit. But that doesn’t mean we all have to do that too. This year I did up-cycle last years ornaments by covering them in fabric. But it’s not a permanent change (I could easily remove the ribbon and fabric and be back to my old ornaments in seconds), it cost me about $11 to do 36 ornaments and it took me about an hour altogether. Everything else has either been given to me/Hubs or are from last year’s Dollar Tree Christmas Decoration post. The moose is actually a wine bottle holder, but he looks nice on my mantle. The wooden Santa is actually a gift I got for Hubs a few years ago – and he actually stays out all year. That snowman holding the snowball (candy dish) was something from my mom, the train ornament is my one and only ornament from Crate and Barrel (that I got the one and only time I’ve been to Crate and Barrel). The three firemen snowmen were a gift to Hubs from his mom when he was pursuing a career as a firefighter. The Santa, Teddy, and Snowman garland is something I purchased a couple of years ago from Avon (and it was on my tree last year). 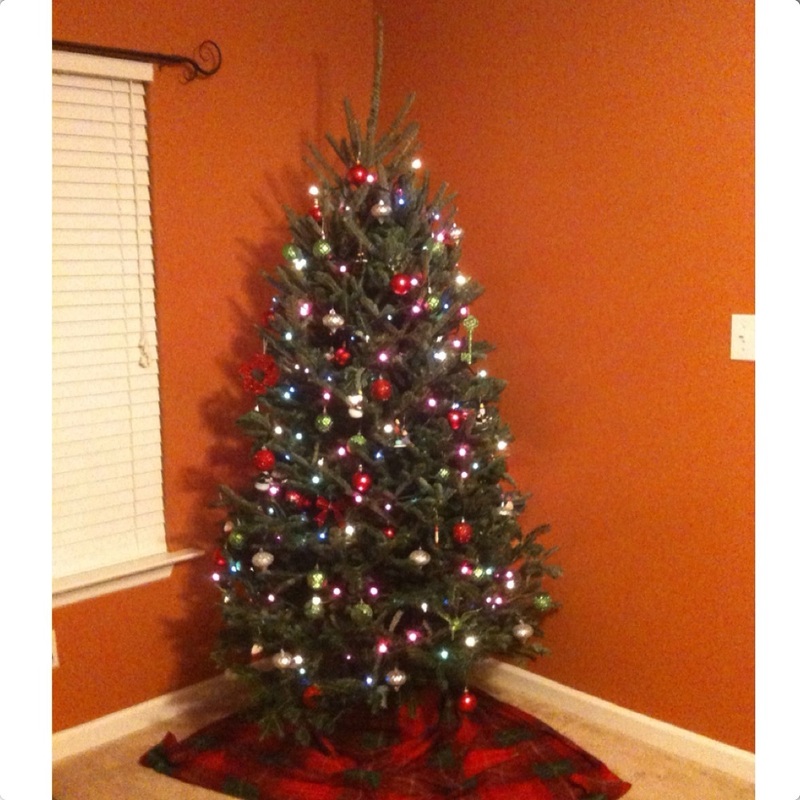 Here is our first Christmas tree as a married couple – December 2011. 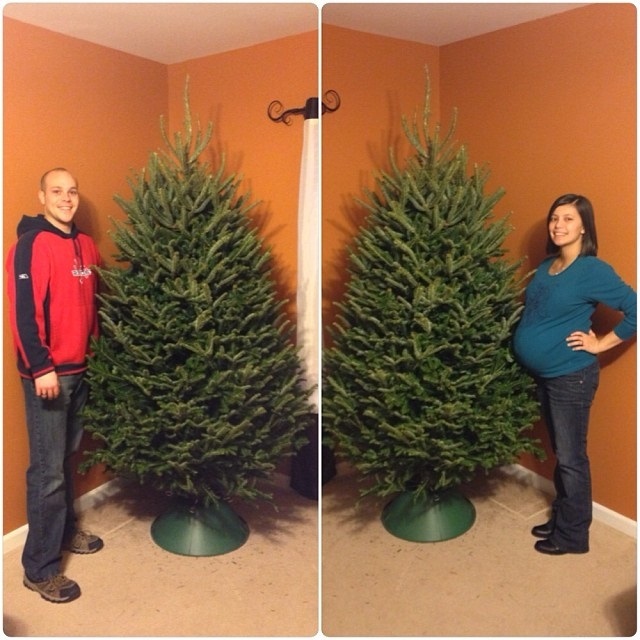 Our second tree – December 2012. And there’s the garland I was talking about (that’s sitting on my TV stand this year). 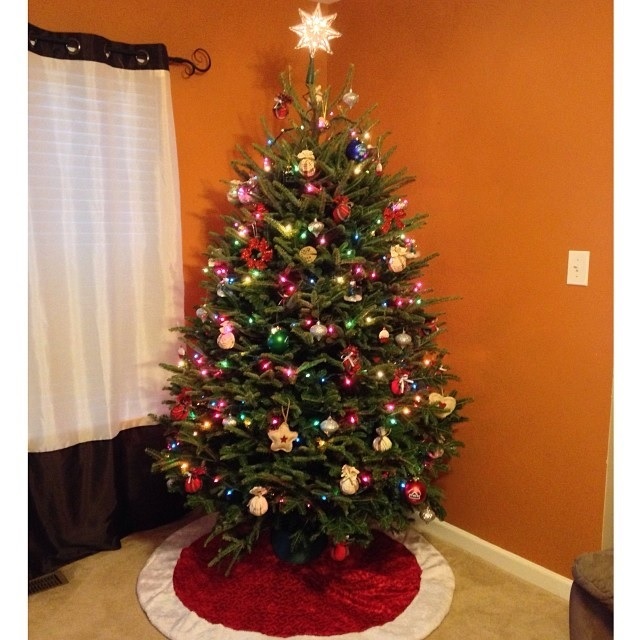 We also got the topper last year and that tree skirt is just a felt one from the dollar store. 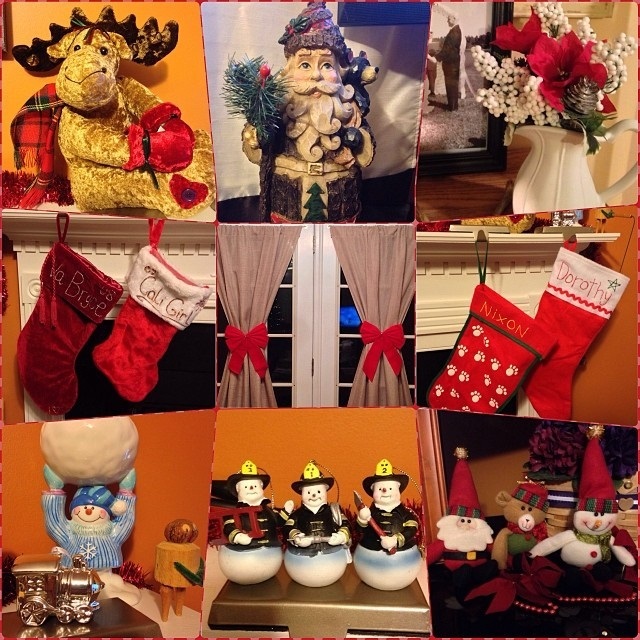 It may seem boring to always have the same decorations and yada yada yada, but again – it’s about the memories. Don’t feel pressured to always have something new JUST BECAUSE everyone seems to be doing it. 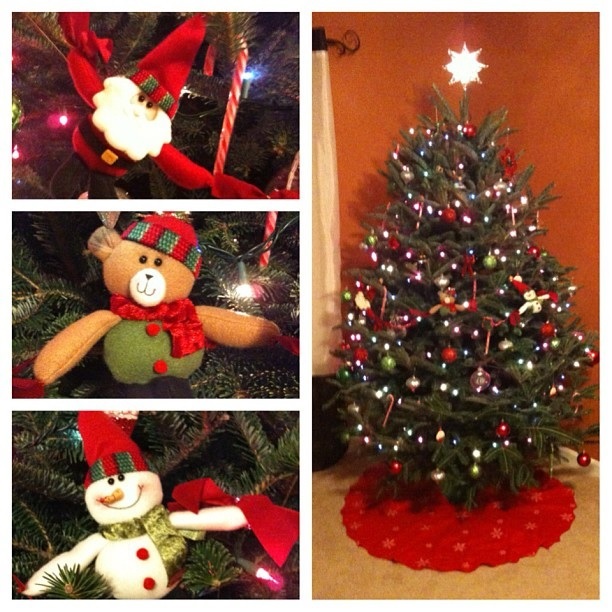 Let’s see this years tree again – it may be our last tree together as a family of two! What are your thoughts on new decor every year? NEW DECOR EVERY YEAR??? ARE YOU HIGH? Or maybe just exceedingly wealthy? Either way, I want some of what you’ve got. No. We do NOT change our decor every year. If we’re lucky, we get an additional, slightly mashed handmade ornament from the kids. Right!??! There are so many “showcase” blogs that have a new theme or something every year and realistically (okay, so maybe it’s their job but still) who can afford that?!!?! My style changes every year so I would love to change my Christmas decor too but financially it wouldn’t work. I did buy a few things on clearance last year after Christmas but I didn’t even put them out, lol. I am also a traditionalist and love the old ornaments from childhood. I personally don’t have any but my husband does. We didn’t put them out this year, but I will never get rid of those. Ever. Your tree turned out beautiful. Y’all did a great job!